Shigeru Miyamoto is a famous game designer, and the creator of such games as Donkey Kong, Mario, The Legend Of Zelda, and Pikmin. In his spare time he likes to jump up and down like a crazy man. 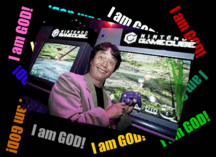 As the screenshot on the right demonstrates, after Nintendo split with Rare, some gamers accused Miyamoto of having a God complex. This page was last modified on 10 July 2008, at 19:07.